Clean Air in London (CAL) is launching a revolutionary new App, initially for iPhones and iPads, to build public understanding of the dangers of air pollution after finding many Members of Parliament (MPs) (and others) do not understand these dangers. nearly twice the proportion of Labour MPs (18%) correctly identified air pollution as a top three public health risk compared to Conservative MPs (10%) (and 14% of Liberal Democrats MPs). The new App is being launched to address widespread ignorance of public health risks. It uses the innovative new Clean Air in Cities IndexTM (or Birkett IndexTM), developed by CAL, to report the health impact of long-term exposure to dangerous airborne particles (PM2.5) on the total population in a local area, region and England as a whole. Note: the App does not estimate or display the number of actual deaths from air pollution or the risk for an individual. The App can be downloaded from the App Store. It can be found by searching for ‘Clean Air in Cities’ on the App Store or downloaded here or here http://itun.es/i6xT8pH. the App is free. Users are invited, as they add local areas or regions, to make at least one donation to CAL to support the further development of the App and other projects. Total PM2.5 is the sum of human-made (i.e. anthropogenic) and background (i.e. non-anthropogenic) mass concentrations of PM2.5. The number of attributable deaths for an area depends on the attributable fraction and total number of deaths in that area which means a larger, less polluted local area may have more such deaths than a smaller, more polluted local area. The index is based on Government data and/or has been calculated by CAL using its understanding of the methodology recommended by the Committee on the Medical Effects of Air Pollution. Policy Exchange has estimated diesel vehicles were responsible for 91% of PM2.5 exhaust emissions in London in 2009. CAL hopes to be able to create android, desktop and other versions of the App in future. For example, it would like to include estimates of short-term concentrations for air pollution (e.g. smog alerts) and show the Clean Air in Cities IndexTM (or Birkett IndexTM) for every postcode. CAL would also like to show trends over time, costs and the impact of air pollution on morbidity (e.g. asthma etc. ), personal exposure and other pollutants and extend the index to other public health risks. “The vast majority of over 100 Members of Parliament (MPs) responding to our survey displayed a shocking level of ignorance about the health impact of air pollution. In particular, over two-thirds of Conservative MPs responding said air pollution (29,000 attributable deaths) has less impact than road traffic accidents (1,900 deaths). 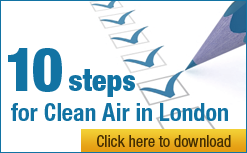 “By using the latest technology, information obtained under access to environmental information laws and the revolutionary new Clean Air in Cities IndexTM (or Birkett IndexTM), Clean Air in London (CAL) is able to give people an indication for the first time of the health impact locally of long-term exposure to air pollution. CAL hopes the innovative new App and index will become a talking point. As far as we know, this index is a ‘World first’. “It is vital people are warned about the dangers of air pollution and given advice about protecting themselves and reducing pollution for themselves and others. People may be encouraged by this new index and App to consider reducing their day to day exposure to outdoor and indoor air pollution and may wish to seek health advice from medical or health professionals if they are concerned about possible health impacts. “Most important, politicians, reporters, campaigners, members of the public and others can now access information about local air pollution. CAL hopes they will ask political leaders whether they understand air pollution is the biggest public health risk after smoking and demand action. 1. Clean Air in Cities IndexTM (or Birkett IndexTM) reports the health impact on the population of long-term exposure to air pollution. In particular, it illustrates CAL’s view of the potential health impact of long-term exposure to different annual mean concentrations of total PM2.5. The index starts at zero and increases in 10 bands of 2.0 micrograms per cubic metre (µg/m3) to 20 µg/m3 in population-weighted exposure to total PM2.5 in a local area or region. The WHO guideline is 10 µg/m3 for total PM2.5 but the WHO has found no safe level of human exposure down to 8 µg/m3 or below. CAL has therefore chosen bands of LOW (zero to 6.0 µg/m3), MODERATE (6.1 µg/m3 to 12.0 µg/m3), HIGH (12.1 µg/m3 to 18.0 µg/m3) and VERY HIGH (18.1 µg/m3 to 20.0 µg/m3). On this basis, the WHO guideline is at the top of the middle of the three sub-bands within the MODERATE band. The App does not estimate or display the number of actual deaths from air pollution or the risk for an individual. 2. The words Clean Air in LondonTM, Clean Air in Cities IndexTM and Birkett IndexTM along with their associated logos are trademarks or registered trademarks of Clean Air in London, a company limited by guarantee, registered in England and Wales, with company number 7413769. 3. iPad and iPhone are trademarks of Apple Inc., registered in the U.S. and other countries. App Store is a service mark of Apple Inc.